A poor mother is woken up from a relaxing slumber by some nuisance shaking her RV, pointing a flashlight in her window, heating up her doorknob and absconding with her daughter. Understandably upset, the mother, Darlene Morris runs around in circles with her son and howls at the moon. Mulder reads about this in a tabloid and deems this the case to end all cases because of it’s proximity to a lake he fancies. Section Chief Blevins is not impressed by this source and, feeling that Mulder is manipulating bureau resources due to his claims that his sister was abducted by aliens, tells Scully that he is going to shut down this case but only after Scully helpfully provides much needed exposition on Mulder’s sister’s disappearance. Scully is a bit surprised that the Section Chief of the FBI is filling a Junior FBI agent in on his decision-making process. She’s even more surprised when Blevins allows the investigation when she assures him that the lady in the tabloid reported seeing a UFO years ago. Blevins is fickle like that. Upon arriving at the Morris household in Sioux City, Mulder solemnly stares at pictures of Ruby Morris to let Scully know that he is projecting his sister issues on this poor family. He then goes to lean on Ruby’s brother Kevin for moral support. Kevin for his part just wants the man to fix his tv but Mulder is so unconcerned with anything other than his own feelings that he ignores the boys plight and forces Kevin to continue learning binary code. At this point, Mulder and Scully find themselves embroiled in a very rote whodunnit with pointless notes, unneccessary pregnancy storylines, and a clandestine meeting with a shifty eyed idiot who brings attention to a crime she committed that no one was even aware was a thing. Thankfully for her, she is dealing with ace FBI agents Mulder and Scully who are distracted enough by the sounds of books falling in a library that they allow the idiot to vanish. After drinking to forget their ineptitude at a local biker bar, Scully is sleeping one off when the NSA barrels into her hotel room demanding to know where Mulder is. (Not seen onscreen is Scully telling them to check Mulder’s hotel room and the NSA calmly knocking on Mulder’s door). The NSA grills Mulder about Kevin and accuses him of turning the boy into a National Security threat by not being there for him when he needed his television fixed. Mulder is skeptical but chooses to direct his anger towards Scully who never believes anything remotely paranormal but gets peer pressured mighty easily into believing an innocent boy is a threat to National Security. Feeling a bit down that their investigation has frankly been a trainwreck at this point, Mulder and Scully investigate Kevin’s binary code and realize that, by refusing to fix Kevin’s damn television, Mulder had inadvertently encouraged Kevin’s creative/plagiarizing side. The agents excitedly run off to tell Darlene about this, thinking it will absolve them of the sin of allowing the NSA to apprehend Darlene and her son. Strangely enough, Darlene wants the two of them to stay the f*** away from them. Feeling even more down because nothing they have done during this case has been remotely competent, Mulder and Scully wander to the lake where Ruby was taken. Naturally, they stumble around doing nothing until they encounter a wolf pack that solves part of their case for them by finding Ruby’s dead boyfriend. Mulder and Scully mutually agree to omit the part about wolves from their field reports. Mulder implores the wolf to stay quiet on the matter. So anyway, Mulder is irate that he’s wasted the past 30 minutes dealing with nonsensical matters involving secret meetings in libraries, clairvoyant wolves, ridiculous murder mysteries, red herring pregnancies, and biker bars when they really should have been working harder on helping Darlene and Kevin. When Scully implores Mulder to stop figuratively chasing after his sister, Mulder has to compose himself knowing that if he has handled Samantha’s abduction in a manner similar to their handling of Ruby’s, he has done a complete disservice to his entire family. Eager to make amends for doing a terrible job of helping the Morris family thus far, they head back to the lake where in a span of three minutes, they find the missing RV, they help Darlene who has taken a spill in the woods, they save Kevin from being run down by motorcycles, and they find Ruby. Case closed! Who needs no stinkin’ wolves?! Now that our lovable agents are super cocky because they solved the case before some wild canines were able to, they try to weasel their way back into the Morris’ lives so that they can talk to Ruby and learn what happened to her and why she is friends with idiots like Tess. Mrs. Morris is understandably still miffed by the utter travesty that was Mulder and Scully’s investigation into the matter and shuns them, sending them scurrying back to DC. So the recap above may sound like I thought this episode was terrible and for the most part, it is bad. They set up this storyline about a possible UFO abduction but then thought that maybe it would be fun to spend 75% of the run-time dealing with red herring after red herring. It feels like they wanted the viewers to really be on the fence on what happened? Was Tess involved? Were there aliens? How is the NSA involved? Maybe she just ran away??? But none of it came together in the slightest. I mean, there is a scene where Mulder and Scully find a body BECAUSE A RANDOM WOLF LED THEM THERE! This is a thing that happened. Thankfully, the X-Files went away from trying to emulate a standard police procedural because those parts are awful. There is the aforementioned wolf scene, there is the hilarious scene in the library where they met Tess and then the good cop – bad cop routine with Tess later. The wolf scene is flat-out dumb but atleast it flies by. The scenes with Tess feels like everyone is trying just a little bit too hard. None of it felt natural. 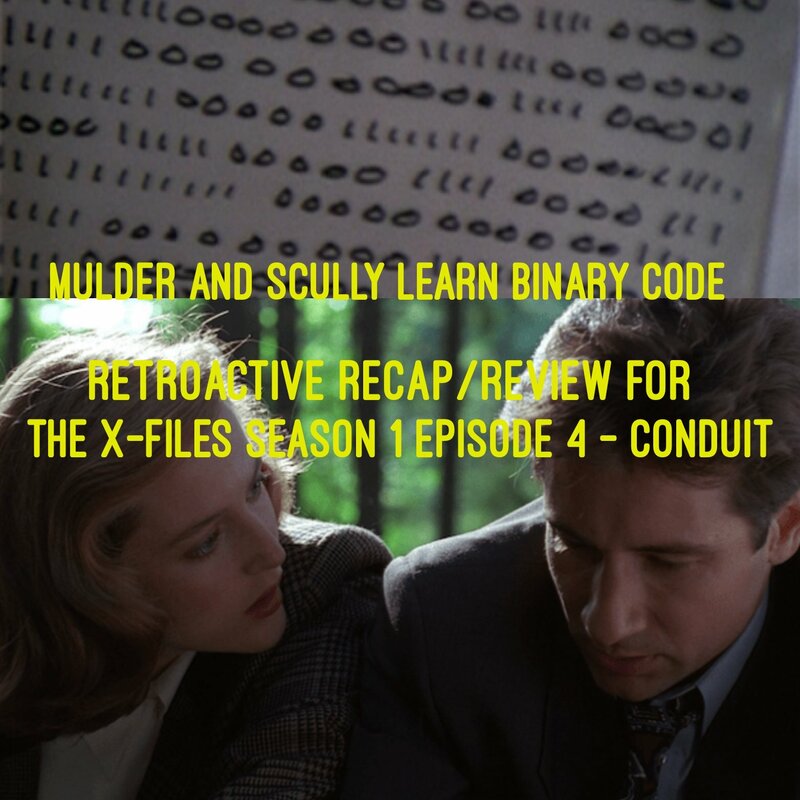 Even the conduit portion of the episode called Conduit barely registers. I mean the boy is channeling something from the TV, the NSA is not happy about it, the drawings turn out to be classical music/DNA strand images/etc but also a picture of Ruby, and then Kevin is almost run over by motorcycles. Yegads, I’m used to not getting the whole explanation by an episode of the X-Files but this was something else. Just a few more comments about the bad stuff in this episode, then I’ll get to the little amounts of good. I hate when television and movies try to generate tension with fake-outs. I especially hate it when there is no logic behind it. Here we have some fake tension of shadowy figures bursting into Scully’s hotel only to demand to know where Mulder is. Guys, he wasn’t hiding! He was in his hotel room next door! Stupid stupid artificial tension. Then there is the climax at the lake. What the hell. Literally as disjointed, anticlimactic, and rushed as possible. Nothing made sense, they jog around, literally gathering up pieces of the Morris family as they go and then the mystery is solved. But despite all of that, the episode does have some strong bright spots, almost all with regards to Mulder’s characterization. Sure Duchovny’s acting is still pretty weak this early on but Mulder’s single-minded passion is well executed here for the most part. We learn more about Samantha’s disappearance and really get a sense of the pain that Mulder has been living with. His determination throughout to just find Ruby may not have been well written when it came to actual plot-points but I do think the one thing this episode does well is portray Mulder as a wounded animal. Its just a shame that the rest of the episode is flat-out terrible.